A Birthday and A Knife Set GIVEAWAY! I started stock piling recipes onto this little blogspot of mine. the Internet is a tricky beast to maneuver you know! What with HTM…L? is it? tumbling around through my noggin for a good long while. Still is, if you want to know the truth! maybe even two and a half! And I’ve come to the realization that there are a few things about this food blogging business that I know, for sure. I love cooking for this blog. I love thinking about what to cook. I love that you show up to read it! I love to hear about your cooking successes! And the VERY most important thing I’ve learned? This blog would be pretty lame with out you. It would just be a lonely old corner for me and my butter and sugar. for just being so all around great. You’ve made it possible for me to have a job that I love. is a luxury one should never take for granted. To show my appreciation…I bought some knives for you. Ok, not really for all of you. If I had Oprah’s bank account….I would! But for TWO of you! 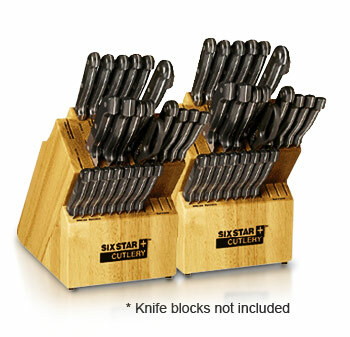 This is the knife set that I use everyday in my kitchen. I love it to pieces…don’t know what I’d do without it. To enter this giveaway…I’m hoping you’ll give me a little feedback. All you have to do is tell me what you’d like to see more of on this site. More Easy Dinner Recipes, Bread Recipes, Dessert Recipes, Cookie Recipes, Side Dishes, Salad Recipes, Potluck Dishes, Cute Recipes, Soup Recipes, Recipes for Kids…. whatever you would like to see more of…. I’d sure like to hear about it. two lucky winners to be announced on Friday morning. PS….next week I’ll be posting a new recipe every day. I’ve got a lot of great things in store for you! Love your blog! Thanks for sharing your wonderful recipes. With my busy household I love the quick and easy! I love this blog, for the fab recipes and the wonderfully entertaining stories that allow us to get a glimpse into your life. I would love to see more 1-pot dinners…I hate doin' dishes, 'ya know? The recipes I look for the most are ones that use common items from the fridge or pantry, since “weird” items my kids will not eat. Love your blog! I would love to see more easy dinners and side dishes. While your recipes are amazing, I love the fact that you are teaching me HOW to cook. More tips and tricks please. How about a post titled, “What I learned working at the Lion House.” ? I also love your recipes that imitate restaurant recipes like Cafe Rio Rice, Red Lobster Biscuits, Sarah's Salad, and Olive Garden Dressing. I would love to see you upload videos of you putting some of these recipes together! I love your recipes and use them OFTEN! Thank you! Well, I'm already loving everything you post….seriously. I just look at the photos on the side and nod at every dish…lol. You've actually interested me in wanting to eat green foods…and I am about to be 32. That's quite a huge and amazing feat. I'd love more kid friendly recipes, and of course continued ways to make veggies edible. I am forever thankful for having found this blog…and my family is too! I love your blog. You do such a great job! I've tried several recipes and they are always delicious! Thank you for what you do. Jaime, I LOVE your site. The only thing I would like to see more of is yummy bread recipes!!! I love your site! I've referred many friends to it. What I would like to see is more complete menu ideas. My problem is usually that I can decide on a main dish but have no idea what else to serve with it. Or if there's a perfect dessert that goes with a certain meal (this is usually when I want to have company over). We have loved all the food I have made from your recipes. Thank you for sharing them!! I'm really into sweets, but I am not at all partial to one thing in particular. Cakes, pies, cupcakes, cookies, brownies … I am an equal opportunity baker and sweet eater! I would love to see more recipes for breads and soups or even crock-pot recipes. Our family has tried several recipes from your blog and they have all been a hit here, thanks for all the great recipes! I found your blog a few weeks ago and I LOVE it. Your posts are awesome! I love your humor and all of the pictures. I would love even more quick and easy meals. I also love your desserts and look forward to each post. Thanks. Hi there! Your blog is one of my go to blogs when i need something GREAT! So thank you for that!! I guess if anything i would like to see more slow cooker recipes. Love your blog! I am always on the look out for new and easy dinner ideas! I'm new to your blog. My two sisters in law have been raving so I thought I'd check you out!!! From being here minimally, I would say I'd like to see more healthy recipes. Like really healthy, because if you can make those taste good, I'm totally on board. I'm looking for some tasty salad and veggie recipes. If you have any to throw out there I'd love trying them out. Love your blog!